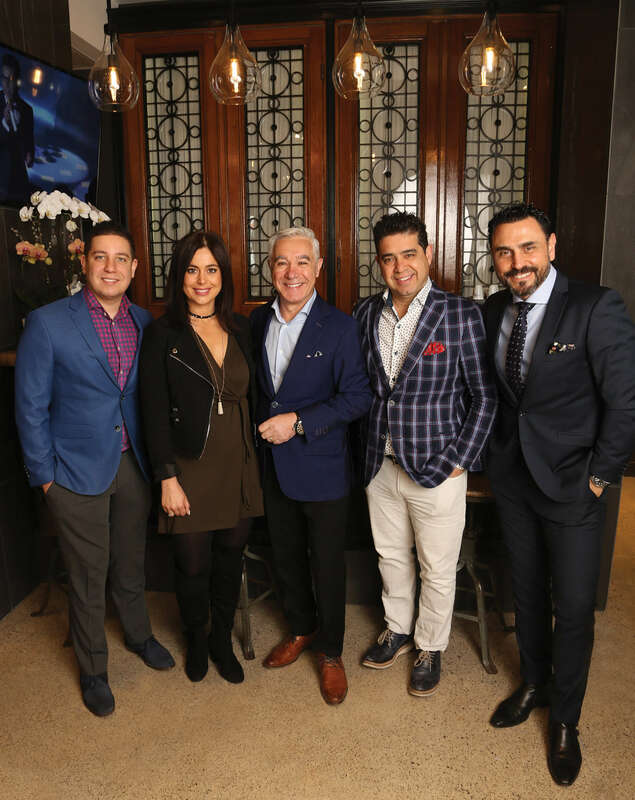 Men’s fashion industry trio Tony Cerone, Gerry Cerone and Fadi Mourani are the power houses behind one of Toronto’s top men’s clothing stores – Long Island For Men. As men’s fashion moves towards a new and challenging direction, designers and manufacturers are offering more options these days, because men are breaking out of the accepted fashion standards. Tony, Gerry and Fadi are combining the best with a mix of brands, from tailored to casual to basics, while playing with colour, proportion and style. They are leaders in setting a new benchmark in men’s fashion trends while stepping out of the traditional norms. 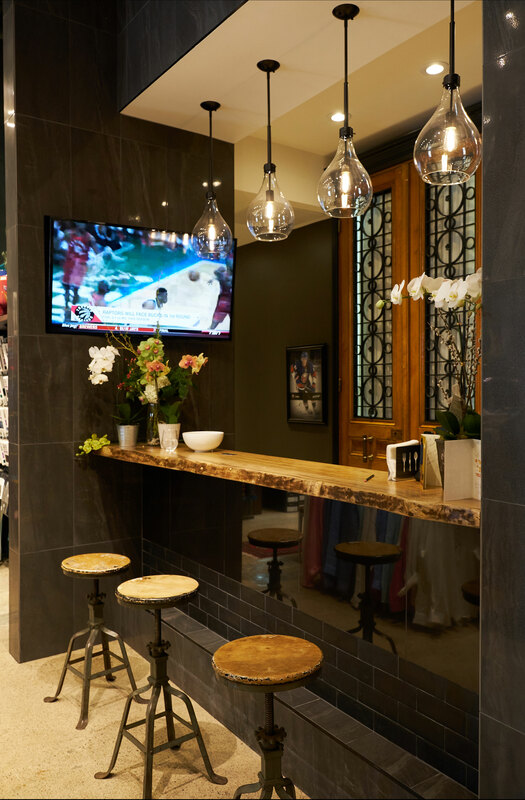 Tony, Gerry and Fadi have hit the embodiment of convenience merging what’s new and hot in men’s fashion in one fabulous Toronto location. They offer a shopping experience like no other while helping their customers look and feel great. There is a direct correlation between continuous customer satisfaction and the success of Long Island For Men. Maintaining customer satisfaction is hard work, and Tony, Gerry and Fadi are more than just mere merchants and curators of fashion, they are also friends with the people that have walked into their shop. Tony Cerone, speaks about the importance of honesty in building the business, “When men come in here, they don’t come in to buy clothes, they come in to buy confidence.” Tony’s passions thrive beyond the elements of fashion; his goals are great service, customer satisfaction and loyalty. Partners Gerry Cerone and Fadi Mourani are in complete agreement. “Sometimes men feel overwhelmed, they’re not sure where to start, but men that shop here, trust us.”, states Gerry while Fadi says, “We do a lot of listening before we attempt to satisfy customer needs”. The expansion has proven to be a great success for the company. 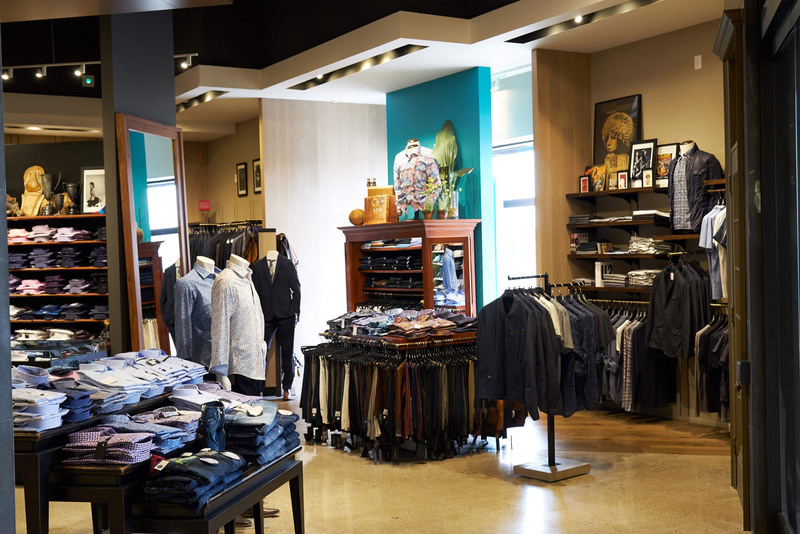 Long Island For Men houses an extensive tailoring department, making their clients’ shopping experience more efficient. 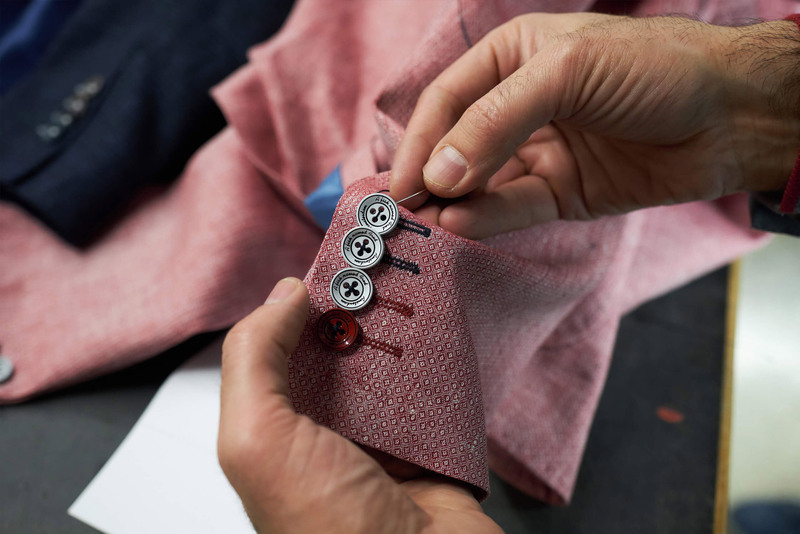 The tailoring department not only offers made-to-measure, but also offers a complete range of in-store and outside alterations. Long Island continues to grow their brands, with the expansion of existing clothing lines like Tiger of Sweden, Eton of Sweden, Calvarese of Italy, Ted Baker of London, Sand, Brax, Alberto and 34 Heritage, just to name a few. 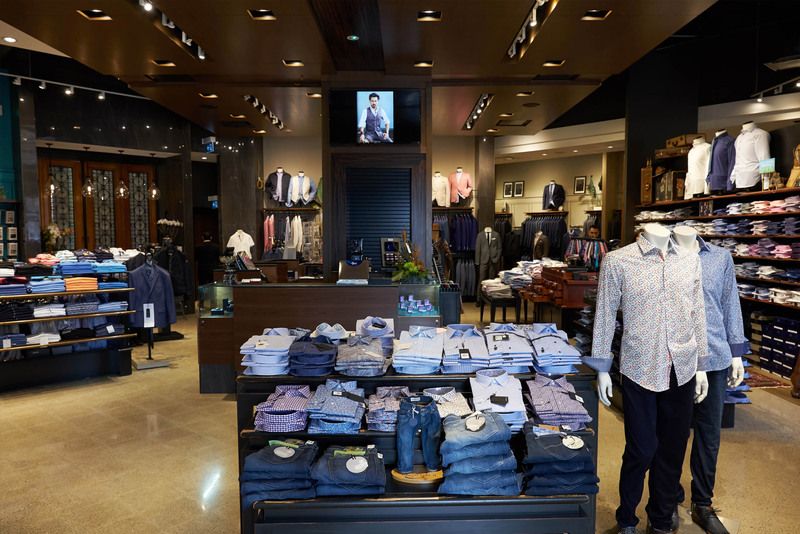 Brand new lines have been added like Lab by Pal Zileri, Jacob Cohen Jeans, John Varvatos, Montecore and R2 Westbrook, along with a bigger and better footwear department featuring brands like Lloyd’s, Bugatti, Ted Baker, Donald Pliner, Loake and a Fish Named Fred. To add to client convenience, the shop now offers 35 dedicated private parking spots, and 2 charging stations for electric vehicles to come. It is without a doubt that these men have built a strong reputation in the industry and have created the utmost version of affordable luxury. Indicative of Long Island’s status are the individuals that they have dressed. Tony, Gerry and Fadi have built long term associations styling professional athletes like John Tavares, Nazem Kadri and Paul Coffey, just to name a few. Relationship building and trust are key to a solid clientele. Long Island is in tune with all the latest trends and their buying process is strategic. It is based on a unified trend analysis research within the industry and most importantly it is related to the needs of the clientele. The relationship with their vendors and manufacturers over the years has allowed them to improve their buying processes not only in Toronto, but in New York, Las Vegas and Europe. “We’re not into fast fashion, we’re into classics,” mentions Tony, quality is fundamental to the overall brand purchasing process and we do it with our customers in mind. For Long Island, having three points of view is a competitive marketing advantage. Three owners/buyers, with different styles is helpful in establishing a broader market reach. As the men’s fashion industry continues to evolve and advance, Long Island For Men will continue to thrive. Long Island doesn’t like to steer their clients into one brand, they combine the best from tailoring, casual and basics into one look. Over the last 26 years they have seen a casualization of menswear and society itself, but at the end of the day, clothing is a tool like any other, like good manners, good etiquette or a sense of humour – it’s helpful and says a lot about you. Long Island For Men is fashion, Long Island For Men is style, and Long Island For Men is confidence. A sale is never over until the customer is happy!